“Every solution to every problem is simple. “Ice contains no future , just the past, sealed away. is sealed up inside, clear and distinct. “The greatest gift of life on the mountain is time. to sit and stare at the shapes of the hills. “Everybody has a little bit of the sun and moon in them. and animal in them. Darks and lights in them. Everyone is part of a connected cosmic system. with some salt and dust swimming in them. that mimics the universe outside. or never wrong and always right. No one. No one exists without polarities. against them, and within them. Happy Boxing Day, my friends. On Boxing Day we celebrate the simple truth that we have survived another Christmas. Our Jewish friends might also celebrate that the Christmas season is winding down, but they are quite busy with Hanukkah, which just began on Christmas Eve this year. They will celebrate their third night tonight. In Europe, today is also St. Stephen’s Day and the Christmas celebrations of family gatherings and celebratory food and drink continue. In past times, the wealthy gave ‘Christmas Boxes’ of food and gifts to their employees and vendors. Some of us still remember the postman with a little something this time of year… and ours has certainly earned a little appreciation! We’ve had packages left at our door before 8:00 AM more than once this month. Some of us still observe the old “Twelve Days of Christmas,” and will keep our Christmas lights up and plan gatherings with friends and family through the first week of January. Our Christmas tree is usually still up as January draws to a close. After all the fuss of putting it up, one may as well enjoy it until it dries out, don’t you agree? Others await this special shopping day each year to score the best deals of the season while retailers try to clear out their remaining holiday merchandise. Your inbox, like mine, is probably already flooded with special messages from every online retailer with whom you do business and a few more hopefuls…. But many of us with extended families close by will find themselves traveling to one or another home today for ‘second Christmas.’ We’ll be visiting with those we missed, or who missed us, yesterday. We won’t find ourselves shopping, but probably will have a completely enjoyable day with loved ones. Whatever you do today, please enjoy the day. Allow for a bit of relaxation after the rigors of the Christmas shopping/ cooking/ decorating/ card writing/ crafting/ party/ season we’ve just finished. December always feels like a marathon to me, and I push myself to ‘get it all done’ by Christmas Eve. Now it’s finally time for a bit of rest and enjoyment. Maybe you feel that way too, and have put away your rolls of wrapping paper and unused cards with the same sigh of relief which escaped my lips yesterday afternoon. What’s done is done, and I’m not going to be tempted to lose these last, sweet days of December doing much more. My first gardening catalog of the new year arrived on Christmas Eve. What a sweet gift postman ‘Santa’ left for me on Saturday! It had a nice selection of ‘New’ 2017 introductions to savor. That said, I can feel the joyfulness of ‘Boxing Day’ in this morning’s light. Another Christmas has come, and now we can sit back and enjoy those things which matter to us most. We can gather with loved ones if we want, but we’re also free to head of to our favorite chair with a good book or catalog. And there’s finally time to take a nap. 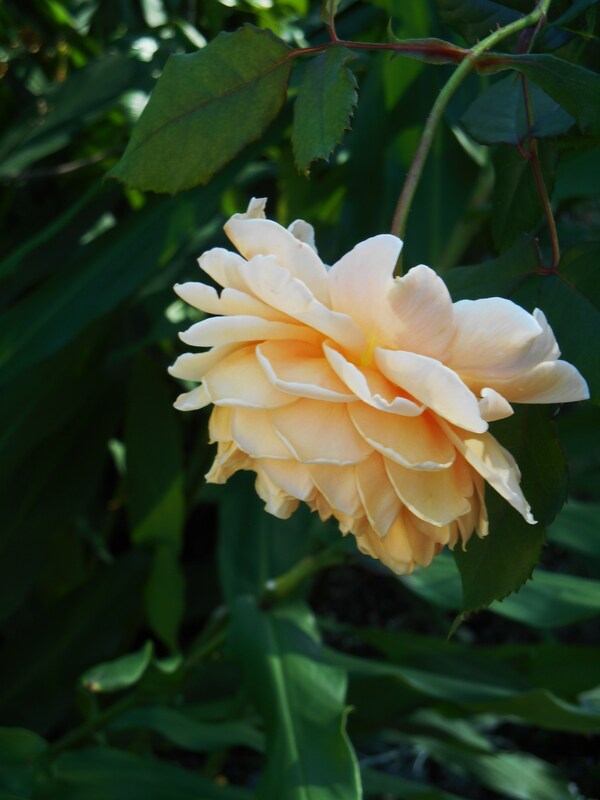 And of course, to head back out to the garden to simply enjoy the beauty of it all…. 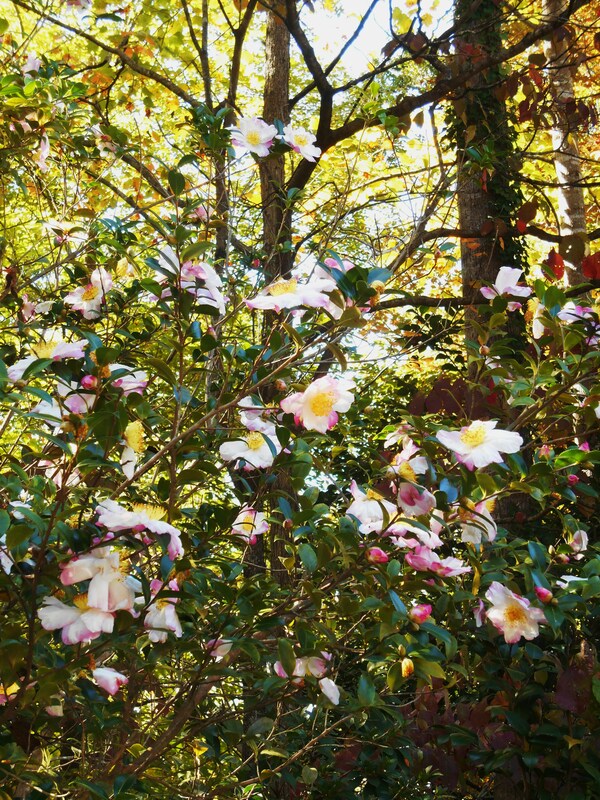 Our third annual A Forest Garden calendar is already our favorite. We’ve kept what we like from past years, and made little improvements to produce a uniquely beautiful and useful calendar you won’t fine from anyone else. Why is this calendar so special? It is created by a gardener, for gardeners. In addition to gardening tips, you’ll also find the first and last frost dates noted for Zones 5-9, information on the moon’s phases, eclipses, special dates for bird watchers, and notes on national and international holidays, feast days, and observances. This calendar is packed with information, while still leaving space for your own notes and reminders. I’ve compiled some of my favorite photos for this striking, full color calendar. Nearly all the photos were taken in our own garden, between December of 2015 and November of 2016. By reducing the total number of photos, we’ve been able to make each month’s page even more beautiful. Our special emphasis this year features flowering woody plants and several unusual foliage plants we’ve found that deer won’t graze. And as always, you will find portraits of some of our most beautiful garden visitors! If you would like to own a copy of A Forest Garden 2017, or order copies to give at the holidays, please contact me at woodlandgnome@zoho.com with your order and contact information. I’ll get back in touch to let you know where to send your check. The calendars remain $15.00 each, which includes postage within the United States. 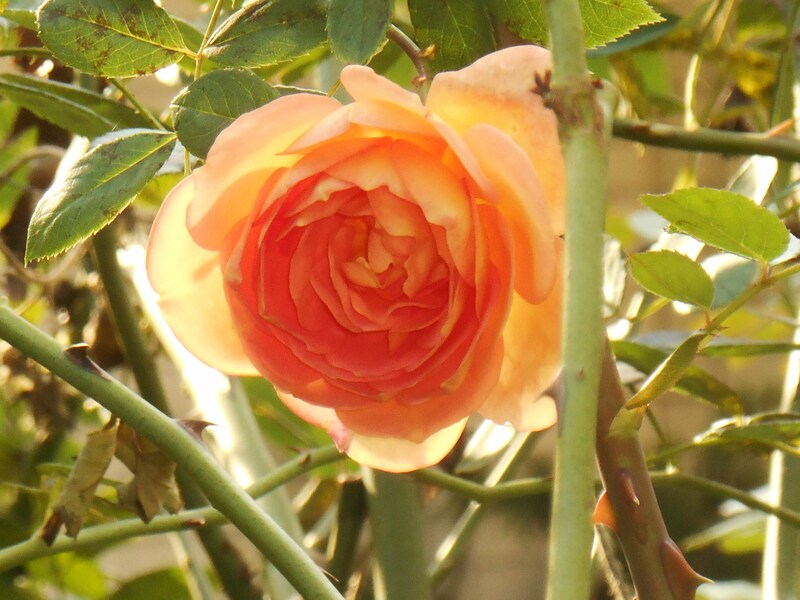 Magical autumn roses still blooming today in our garden…. 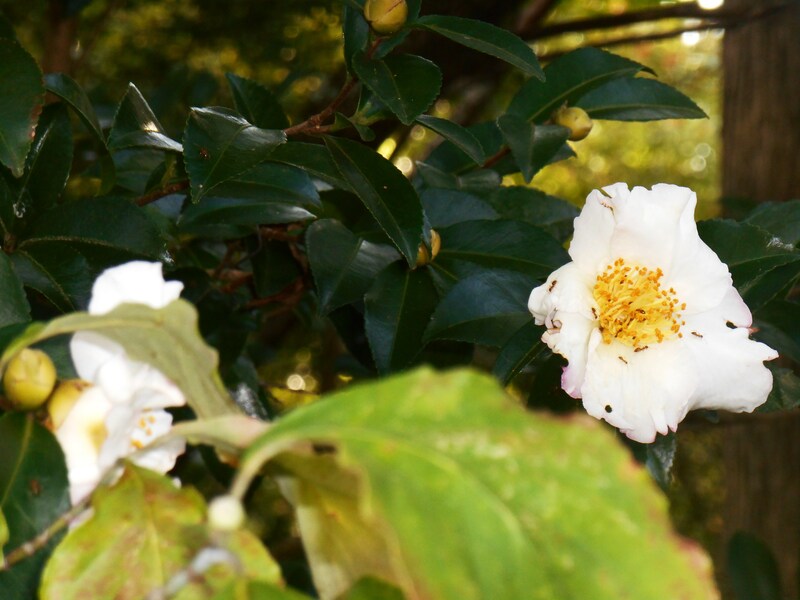 The first Camellias of the season bloomed this week. The garden is looking good again now that the soil is moist, the days are sunny, and the nights are cool. 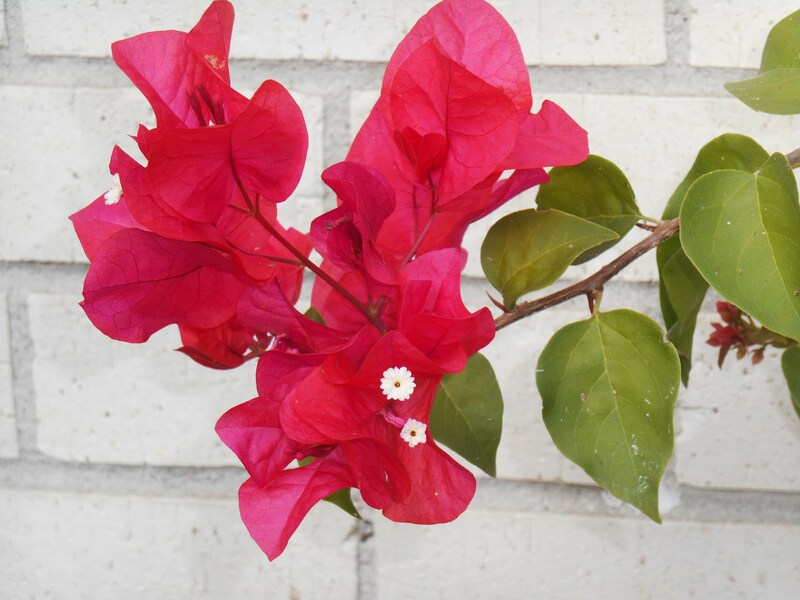 Our autumn flowers have begun blooming, filling the garden with vivid red Pineapple Sage, soft blue Mexican Bush Sage, pristine white Camellias and vividly rose pink Bougainvillea. 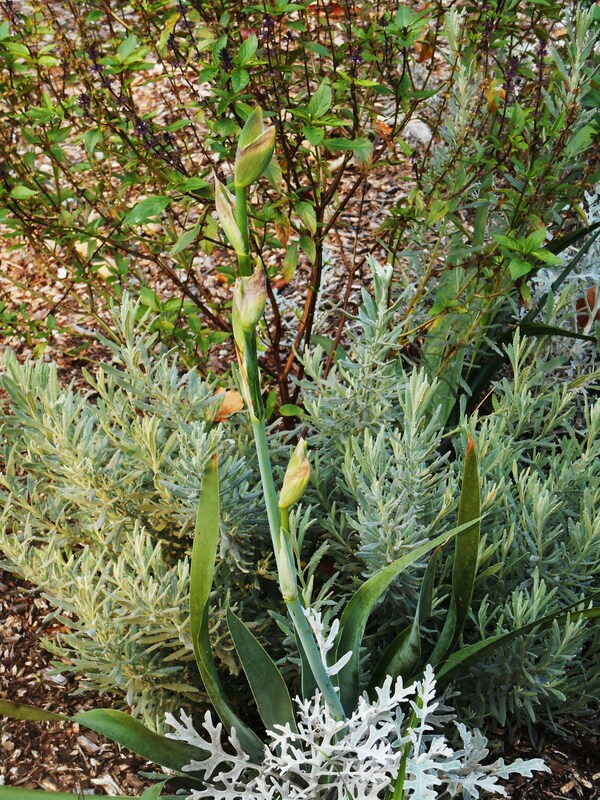 We even have a stalk of Iris buds ready to open on a rebloomer transplanted this past spring. 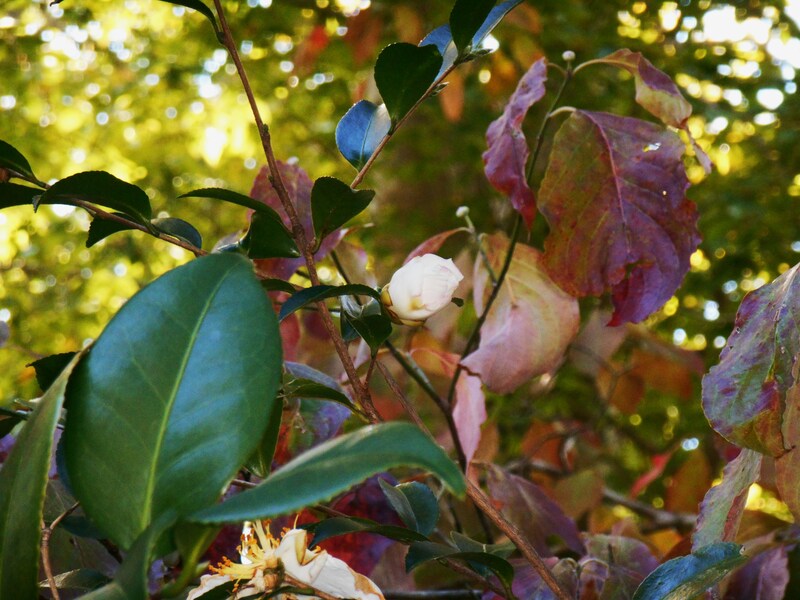 Even as brown leaves litter the lawn, summer weary plants respond to our milder weather with vivid new flowers. Some of our most spectacular roses open after October 1st each year and keep coming through early December. Many of our Pelargoniums have also started pumping out plump new buds. 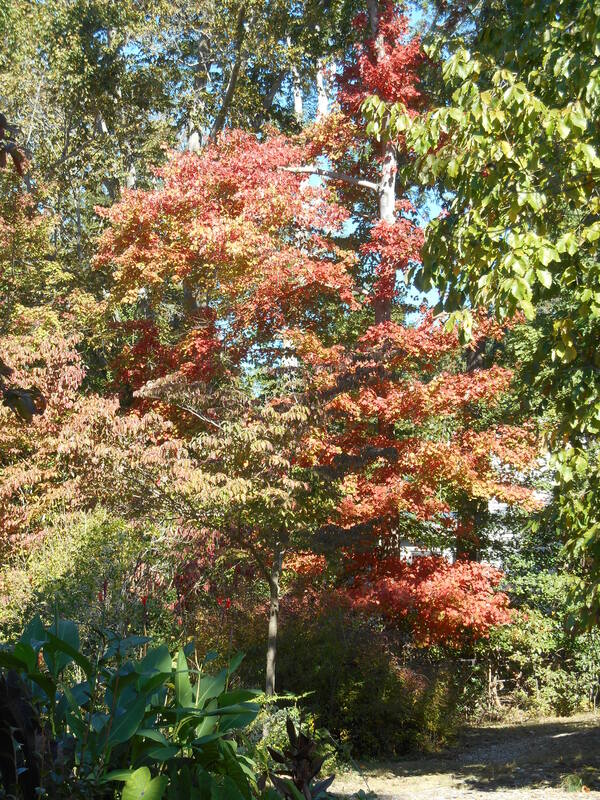 Late October feels almost like a reprise of spring, but with more intense color. 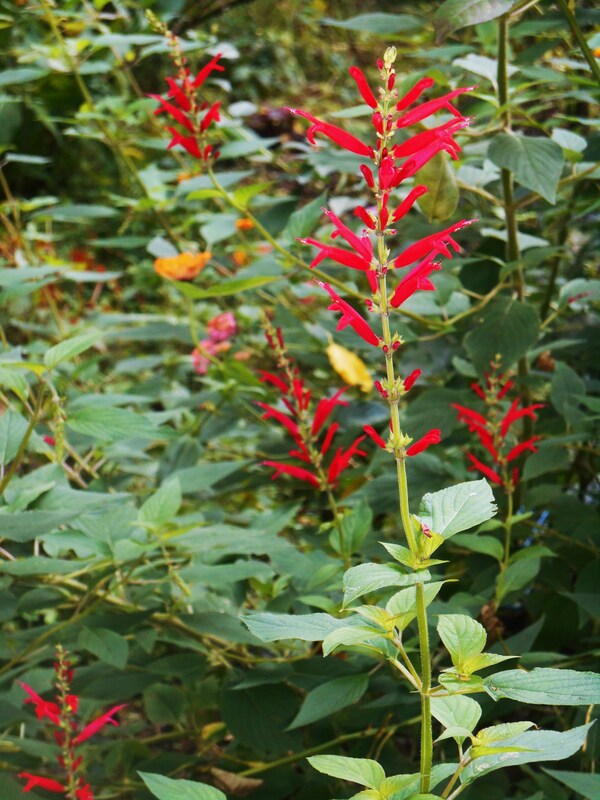 Pineapple Sage waits to bloom until October, filling the garden with fragrant red flowers until frost. We are busy planting bulbs and perennials. I’m ready to start filling our pots with Violas for winter color by the end of the month. October is my favorite time of year for spreading new compost. I bought the last few bags on offer at our favorite garden center this week. Their next load won’t deliver until spring. I’ll use much of it when moving shrubs out of their pots and into the ground over the next week. Some has already gone over a new planting of ‘Thalia’ Daffodil bulbs, now overplanted with Ajuga, Vinca, and some bits of hardy Sedum. A fresh inch or two of compost over freshly weeded beds keeps them looking good through the winter, and helps nourish the bulbs and perennials which will begin growing again in a few months. 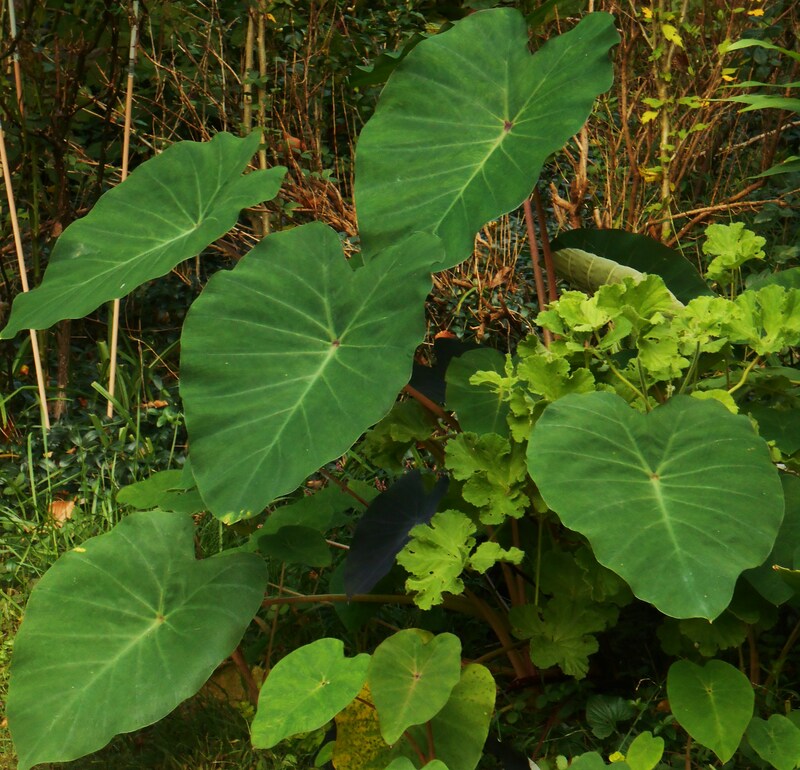 Some plants, like these Colocasia divisions, which got off to a slow start in early summer, have finally come into their prime in these last weeks before frost. Colocasia with a scented Pelargonium have taken their time to grow this summer. The Colocasia divisions really took off after we placed the potted Pelargonium behind them, possibly providing more water and nourishment. Officially, our first frost date is October 15. It is hard for me to believe that frost can come at any time after the middle of next week. I’ve not yet given much thought to moving tender plants inside to the garage, basement, and living room to keep them over winter. But it is time for me to sketch out a plan and begin putting it into action before an early freeze catches us unprepared. 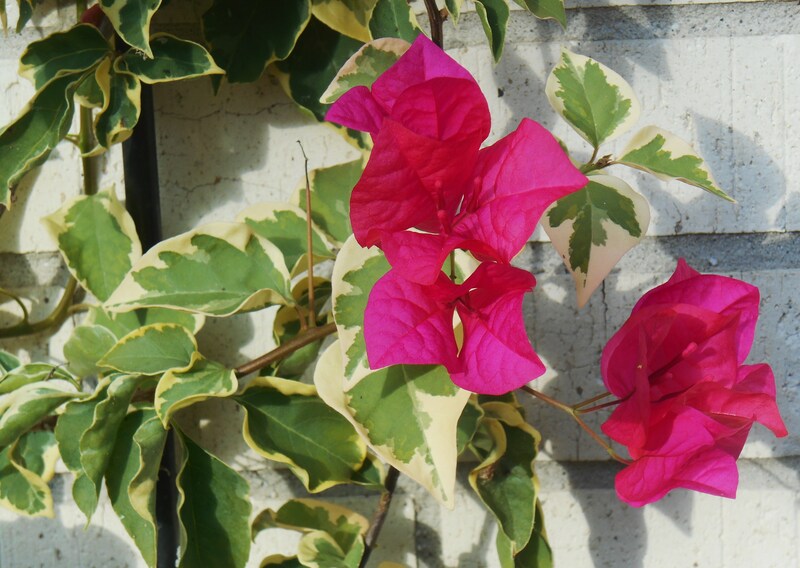 Bougainvillea begins its season of bloom in early autumn, but must come indoors before frost. 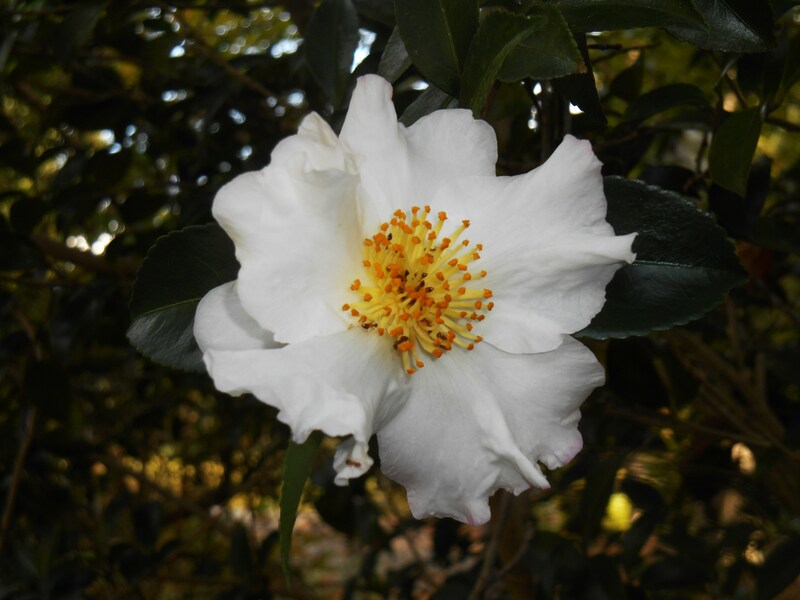 It is a tender woody perennial which won’t survive our Virginia winters out of doors. After a busy few weeks which left me little time or energy for the garden, I’m ready to begin the round of fall projects which close it out for the season. 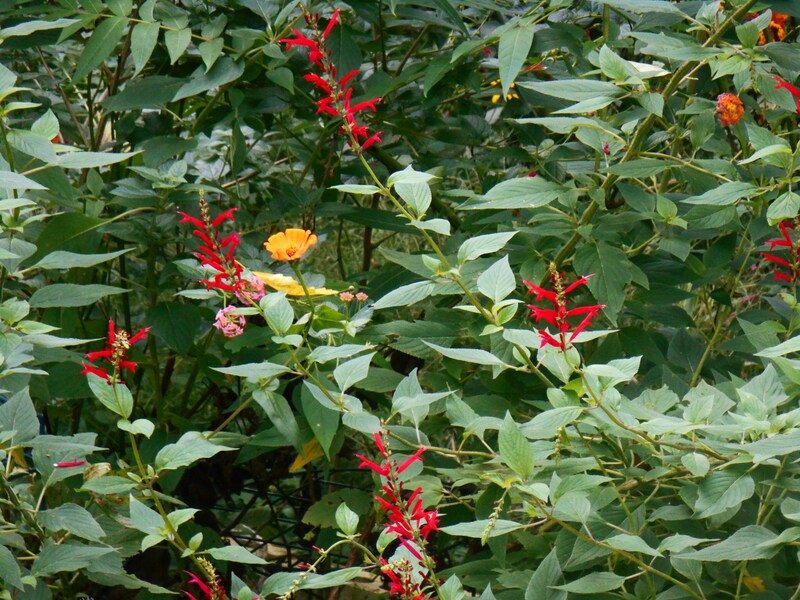 There are Ginger Lilies to dig and deliver to friends; tender Colocoasia, Caladiums, ferns, and Begonias to dig and pot for their winter indoors; leaves to shred and roses to trim back for a final time this year. 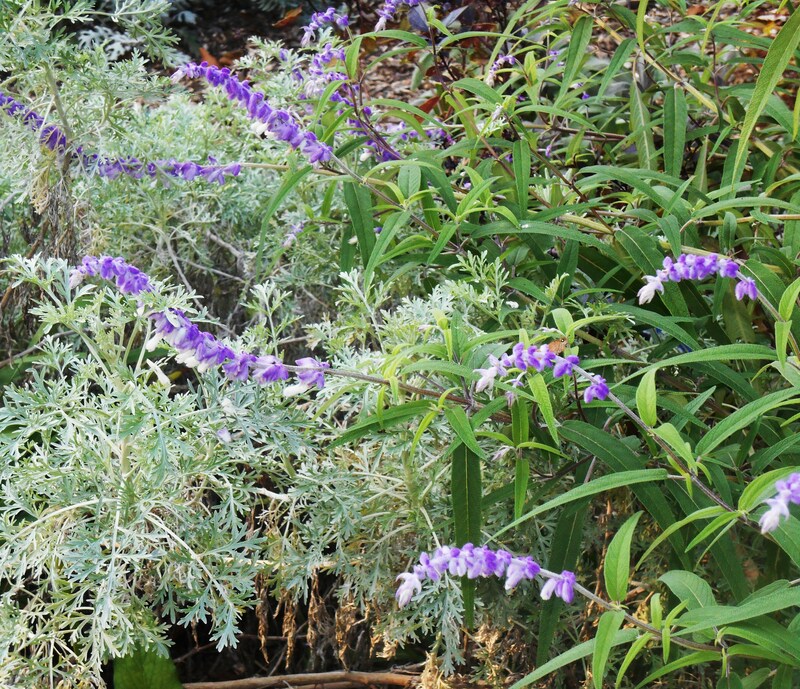 Leaves fall steadily in our garden even as late bloomers, like this Salvia, are in their prime. Taking time to notice what is Looking Good each week keeps my focus on the positive. Many thanks to Gillian at Country Gardens UK for hosting this theme each Friday. Please take a moment to enjoy her beautiful apples this week. Gillian also offers up an enticing recipe for Apple Cake, which I want to try making this weekend with apples from our favorite farm stand. 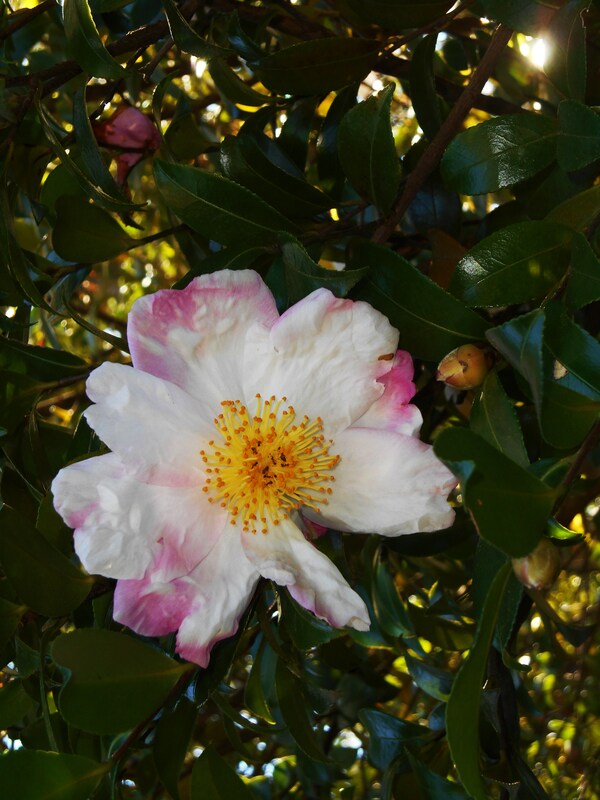 The Camellia in full bloom along our own driveway, setting out for a walk about the neighborhood. Last evening was the perfect everything for a walk about the neighborhood. When I set out in late afternoon it was clear and sunny; not too hot or too cold. All in all it was the perfect opportunity to get out and see the wider world beyond our own garden, and I had the time to enjoy it. 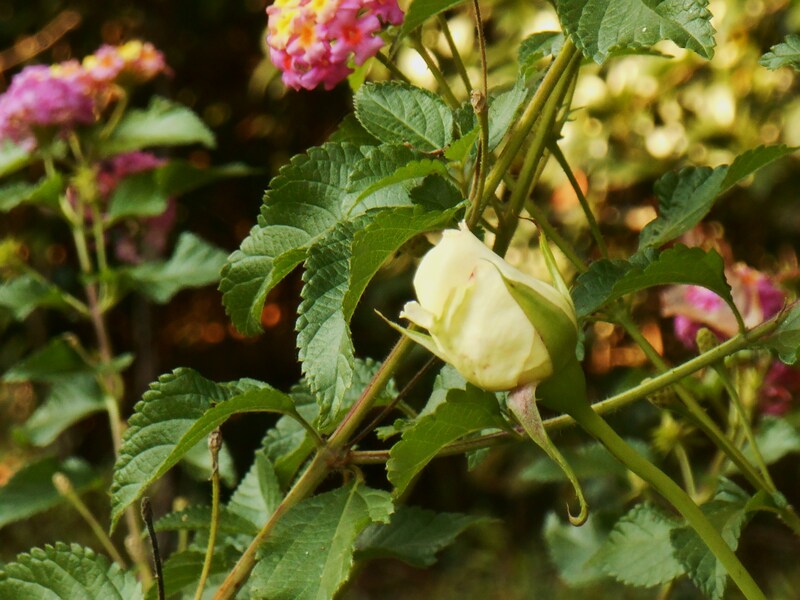 The roses beside our driveway have come into bloom again. My first destination was the home of friends. A friend and I were splitting a bag of daffodil bulbs, and I had a delivery to make. From there, I made my way down the quiet streets of our neighborhood towards the pond. Families were out walking their dogs and spending time with children. 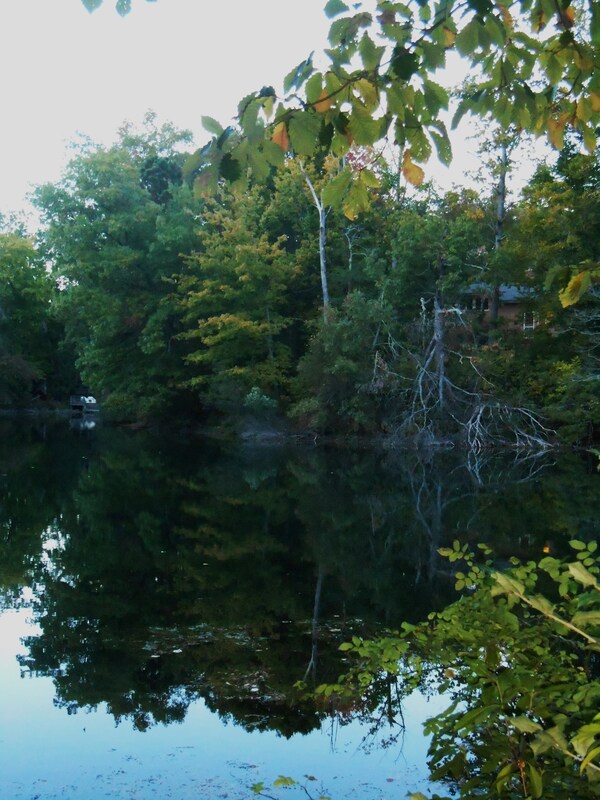 Looking across the pond, the homes are still mostly hidden by trees. 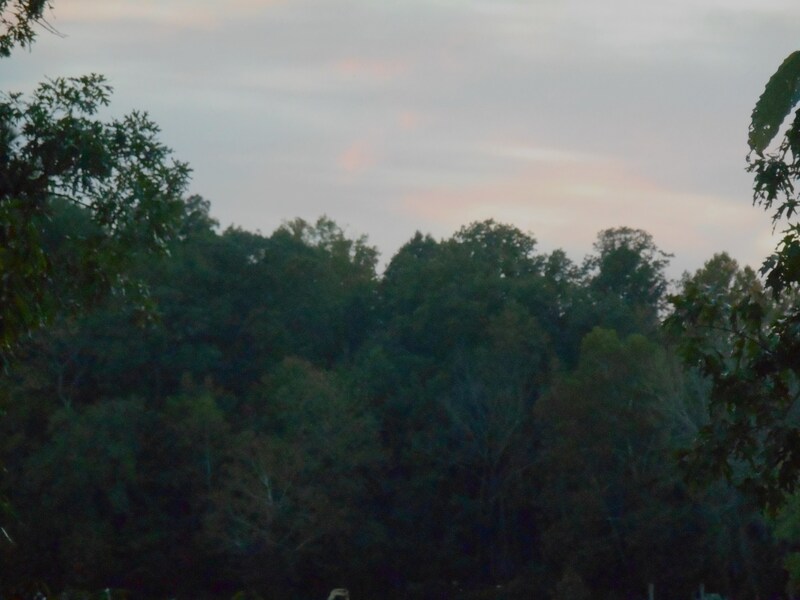 The light faded quickly in this late October sky, and I wanted to make it to the Creek before sunset. Down another friends’ driveway one finds the dusty pine needle covered path across an earthen dam separating our pond from the creek. The path is heavily wooded. Trees have grown here on both sides of the path, making it harder to see through to the water. Birds and squirrels chatter at the intrusion into their private world. I could hear the voices of children in the distance. The homes ringing the pond are still mostly hidden behind the trees. It is nice to be able to walk back here again. Many of us avoid this path once the weather warms each spring. 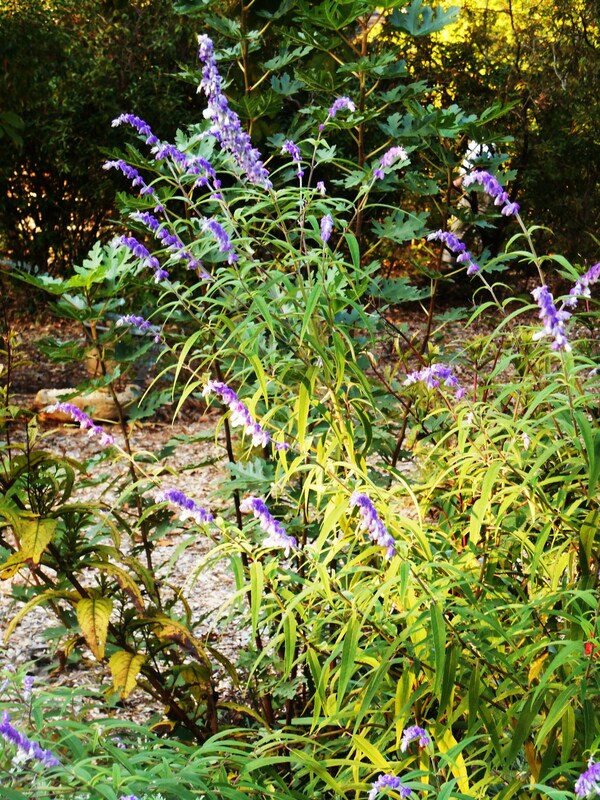 There are ticks and chiggers, mosquitoes and who knows what else in the heavy underbrush. But by autumn, it isn’t quite so hazardous. Or perhaps with long pants, hat and a jacket it just feels like a safer path to take! I can see streaks of pink and purple gathering in the sky over the creek as I emerge through another driveway back to the city street. 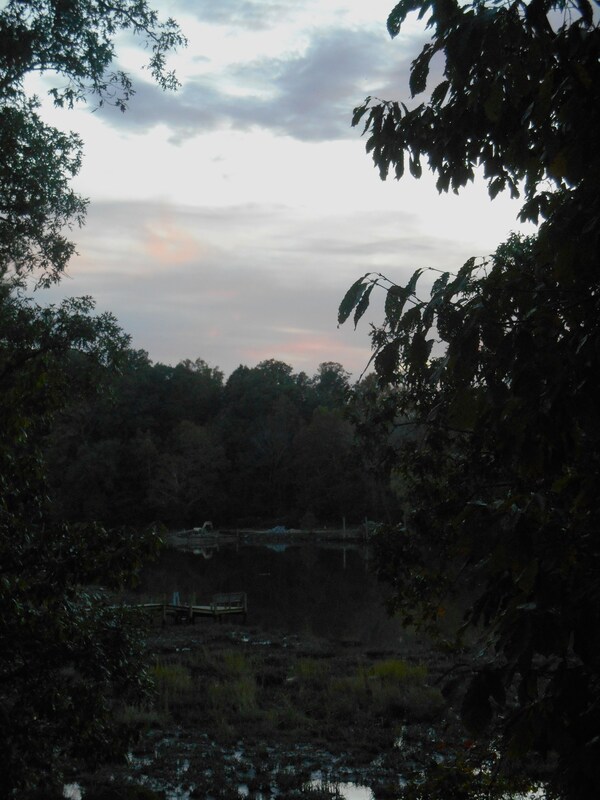 I cut across past the playground, across the deck, and down towards the dock. Darkness gathers, and I wonder whether these photos will turn out at all. 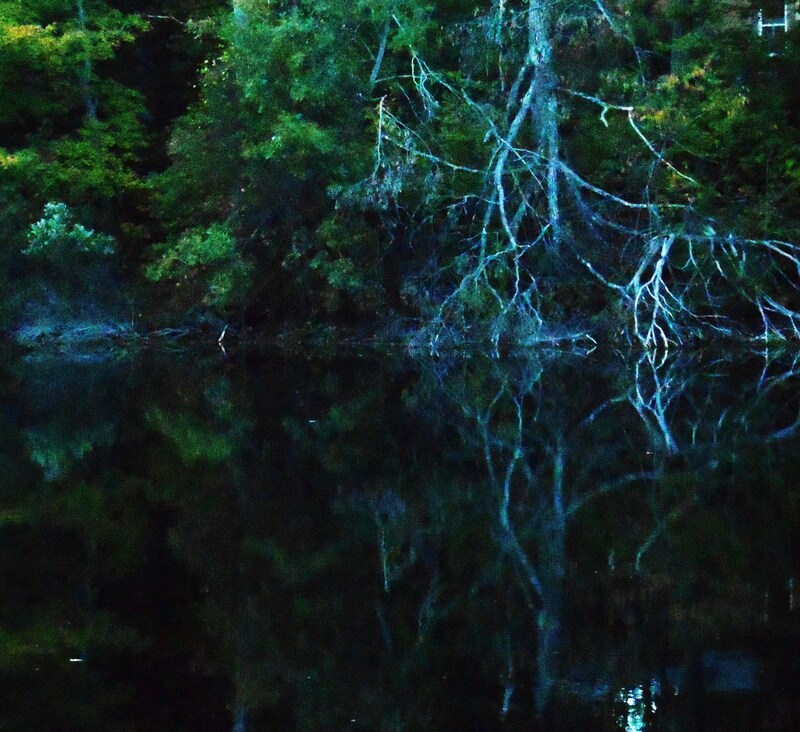 With no street lights, and no flashlight, it is best not to linger by the water for long. There is the long climb ahead on the pathway home. Turning my back to the sunset, I head out across the open field and into the shadows of the tree lined street. Nothing I’m wearing is light or reflective. It is way too dark here for photos, so my camera goes back into the relative safety of my jacket pocket. It is a long steep climb. The exercise feels good, and it reminds me to make this hike a bit more often. And not a single car passes on this leg of the journey. No children’s voices sing out, no dogs bark, and no other walkers call greetings. An occasional lighted window gives the only evidence of neighbors at home along the way. Most are probably out for dinner on this Friday evening. The glow of lamplight greets me as I near my own driveway once again. My partner has turned on every outside light to greet me. But even that pales in comparison to the sky, which has turned a fiery orangey pink in the space of only a few minutes. I can see it again now, above my neighbor’s roof line as I turn towards home. What beauty! In another few weeks, once the leaves have fallen, the sky will open up to us once again at sunset. For now we peek between the trees and above the neighbors’ roofs, basking in the reflected glow of it in the garden. And I’m basking in the peace of it all. I made it back home before dark settled completely across the community, knowing this should become a part of my routine during these gorgeous autumn days. Robin challenged those of us who follow her blog to take a walk and post about it. This challenge is called “Walktober.” Robin will gather up all of these posts, and publish links, so we can go along with one another to the interesting and beautiful places we have all visited. 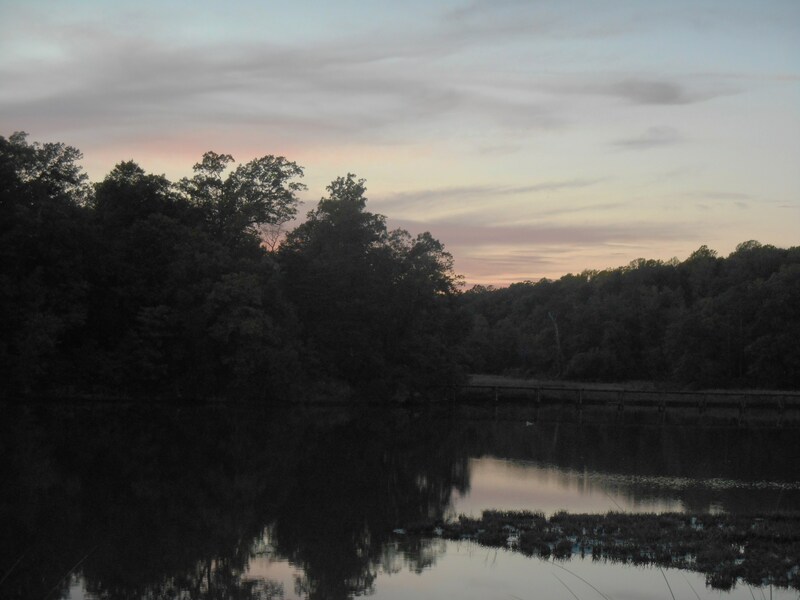 I hope you will follow the link back to Robin’s “Breezes at Dawn” blog to join her for her walk on Maryland’s Eastern Shore. 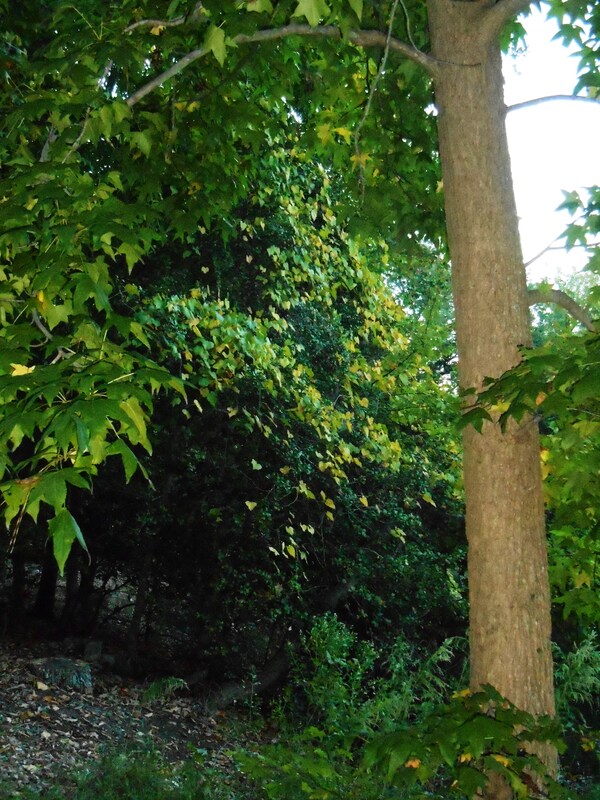 Shortly, I’ll publish a link back to all of the “Walktober” posts so you can come along, too.